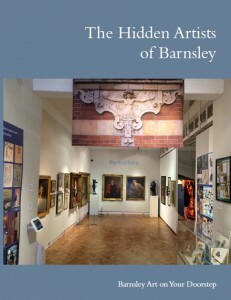 Finally after years of research we have published our book The Hidden Artists of Barnsley. It has been a long and interesting journey since we began the work in 2010. There have been frustrations and exciting discoveries along the way, and we have enjoyed the generosity of the artists’ families in sharing their information. There were tales of tragedy, adventure and triumphing against the odds. The book was to be published at the end of the Hidden Art project so we had to choose a publisher to help us do this. We were lucky to find Jeremy Mills Publishing of Lindley, Huddersfield who specialise in the printing of art books. They have guided us through the process. Choosing a publisher led to a rush of work to finalise all the chapters to be included and to select suitable images to illustrate the book. Finally we were able to submit them to our publisher. They provided proof reading and the design of the book and a proof for us to check. Time was getting short and as we were burning the midnight oil, we realised what a skilled job proof reading is. It was a delight to see our book begin to take shape. Hopefully between us, by careful checking, we have eliminated any errors that we may have made. Our book will be available at Barnsley Library and the Experience Barnsley Discovery Centre (formerly Barnsley Archives and a valuable source of information) as well as the Cooper Gallery where our exhibition was held.